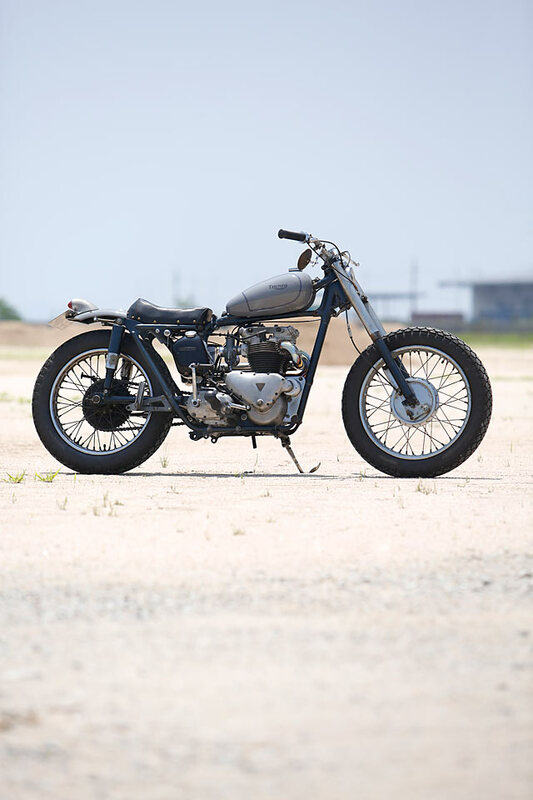 While most Heiwa builds have a killer show quality finish combined with daily rideability that makes them some of the best custom motorcycles on the planet; the customer wanted this bike to have more of a Rat Rod finish. Although very wisely they still desired some of that unmistakable Kimura-san style. 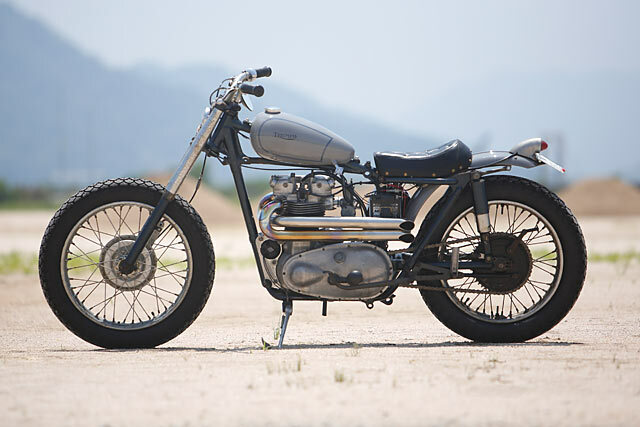 The donor bike came from America, the very market the T110 had been developed for, where consumers wanted more power and impressive top speed numbers. 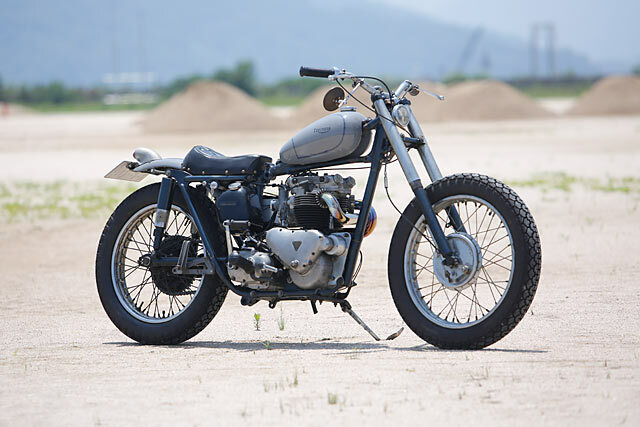 Sadly this old Tiger had seen better days, but that was never a concern for the Heiwa team who regularly wave their magic wand over total rust buckets and yet somehow turn out simply flawless machines. But the challenge on this build was to combine just enough of the original patina with new custom parts to create a look that was consistent from front to back. This meant that while visual changes would be less overt than normal, each one had to fit the brief to a tee or risk standing out like a hammer beaten thumb. 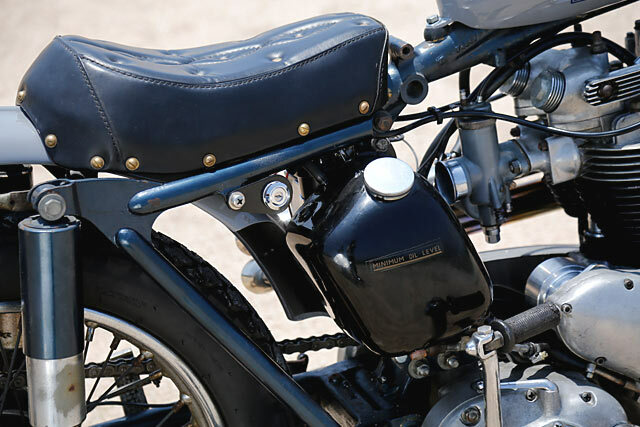 The stock frame remains in its factory original colour and condition, totally unmolested, with all the mounts and brackets left in place should the owner ever wish to go back to stock. 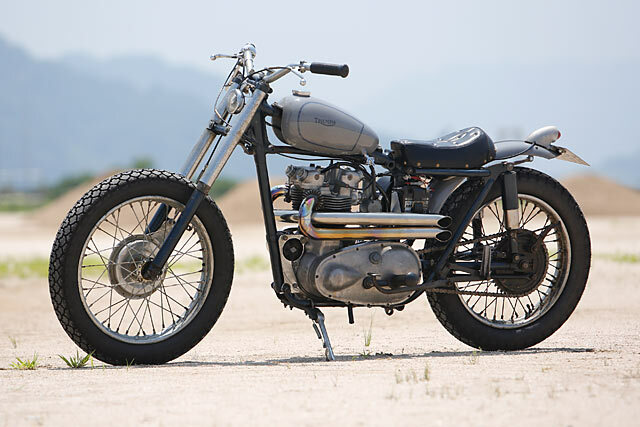 Although with the custom Heiwa bodywork it’s hard to understand why you’d ever want to. Kimura-san scrapped the factory tank and hand crafted a stunning new piece that neatly settles over the stock backbone. 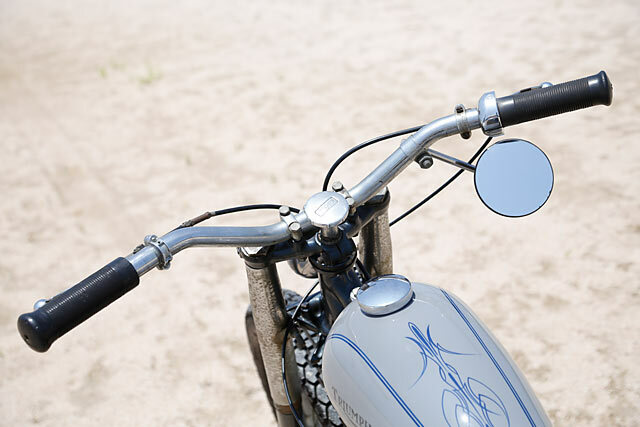 The low tunnel tank is flawless in both metalwork and design and allows more of the classic parallel twin-engine to be shown off. Even the petcock is period correct and the new 2 inch gas cap is one of the few shiny items on the ‘58. To match the lines at the rear end a hand rolled ribbed fender has been employed that covers just the right amount of tyre for looks and practicality. While the two new pieces of tin work are expertly painted a soft bluish grey to work with the factory colour scheme that remains. 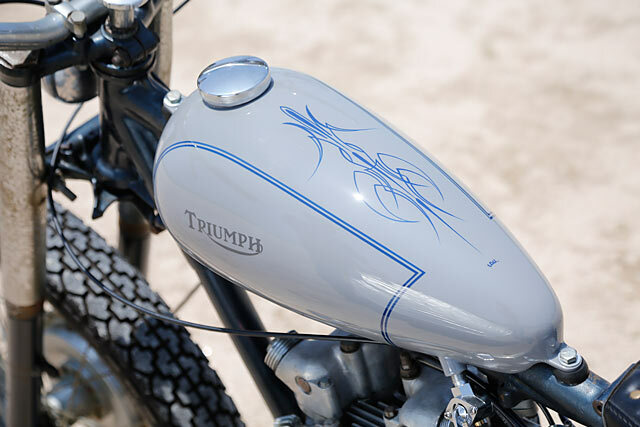 Fittingly the hand painted Triumph decals are extraordinary in their detail and are neatly set off with theme fitting pinstripe work that’s pure hot rod. The standard two up seat had seen better days with America’s largest rats feasting on the foam, but it would never have made the cut no matter the condition. 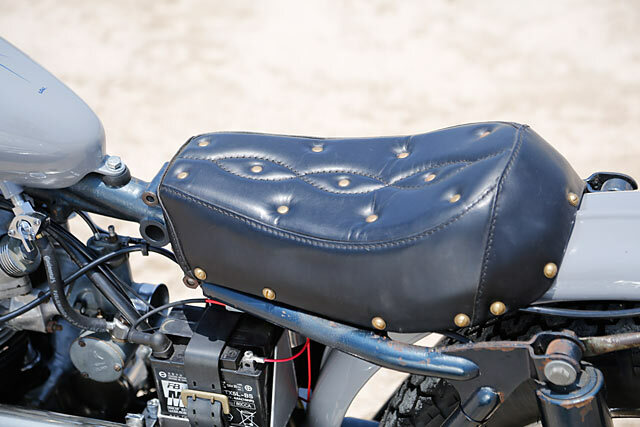 In its place is a vintage styled scrambler piece, generous and plush in its padding and leather work and finished out with unpolished brass studs. To further slim the lines the rusty oil tank and battery housing were removed for more form-fitting features. The oil tank replaced with one taken from a Triumph 6T that sits further under the seat and feeds the engine through all new lines. 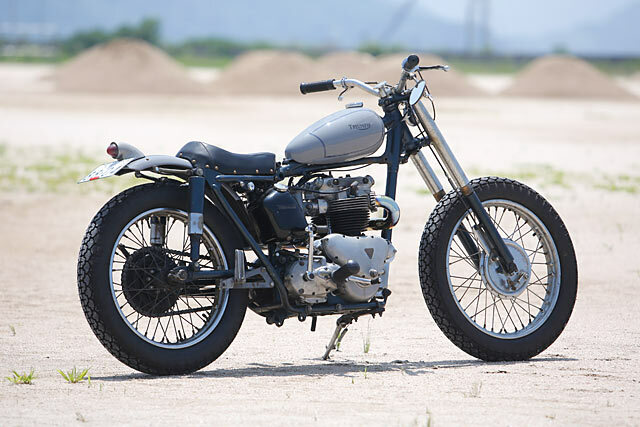 The factory hot rod engine that was designed to be more powerful for the American market was part of Triumph’s continuing evolution of their parallel twin platform. Sadly the motor in the donor bike was less about horsepower and more about holes allowing oil to seep out. 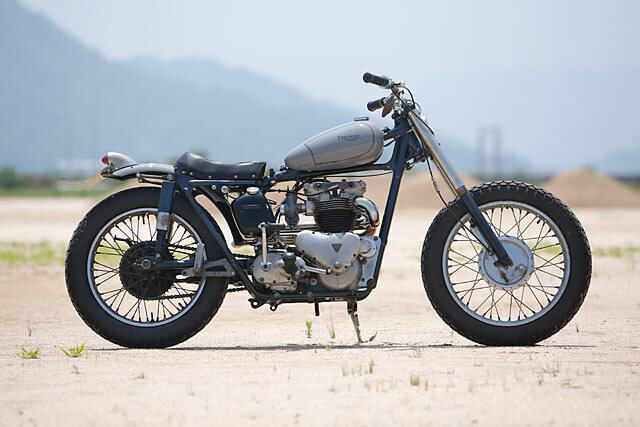 But Heiwa love rebuilding British engines and the 650cc came in for lots of love and attention. Each motor is stripped down to its last bolt on the heavily grease laden wooden work benches of the Hiroshima warehouse were surgery is performed. Perfectly rebuilt to create a reliable daily rider there is some clever additions to provide more horsepower and improved operation. 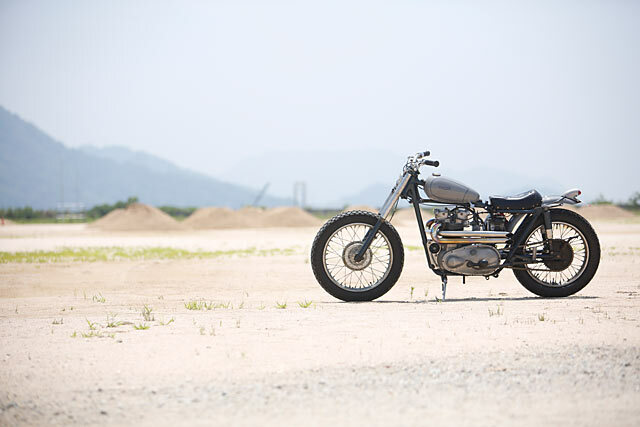 Most noticeably Kimura-san has fabricated his own take on a single sided scrambler exhaust with welds so clean they disappear into the pipes mirror finish shine. 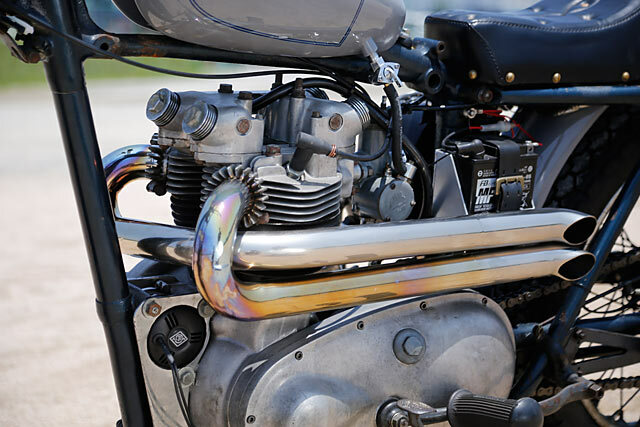 The Amal Monobloc type 289 carb no longer breathes through a rubber hose but a classic bellmouth air intake. With the Amal rebuilt for smoother fuelling and tuned to ensure an easy start, first kick, every time. “While the engine maintains much of the patina to match the rest of the build, one very clever addition transforms its useability”. 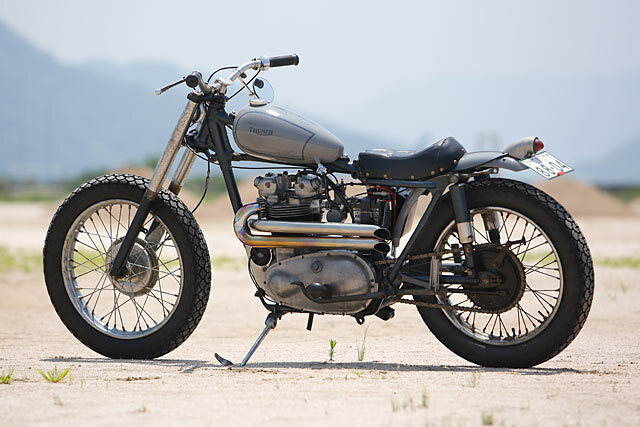 While the engine maintains much of the patina to match the rest of the build, one very clever addition transforms its useability. A new French made Alton generator makes for the perfect replacement for the old dynamo, half the weight and consistent power output. This ensures the small battery that’s been fitted always holds a full charge and now rests in a custom fabricated alloy tray. The rest of the factory wiring was yanked out and replaced, with a modern main fuse for extra safety and a key wired in on the other side. The suspension wears all the ageing signs of a life long-lived, Kimura-san made sure the internals were rebuilt and functioning perfectly. The same too goes for the drum brakes, both still engaged by the original factory hardware. The throttle assembly however was replaced for smooth operation and a set of Amal grips replace the badly perished old rubber. The final touches are classic Heiwa. Simple and yet suppletive, the rear tail light a true classic look. But it’s the small vintage headlight, one simple change that totally transforms the front of the machine. It’s what makes Kimura-san so special and Flavor yet another example of Heiwa’s remarkable work. Even when it’s understated, it never fails to fill your heart.